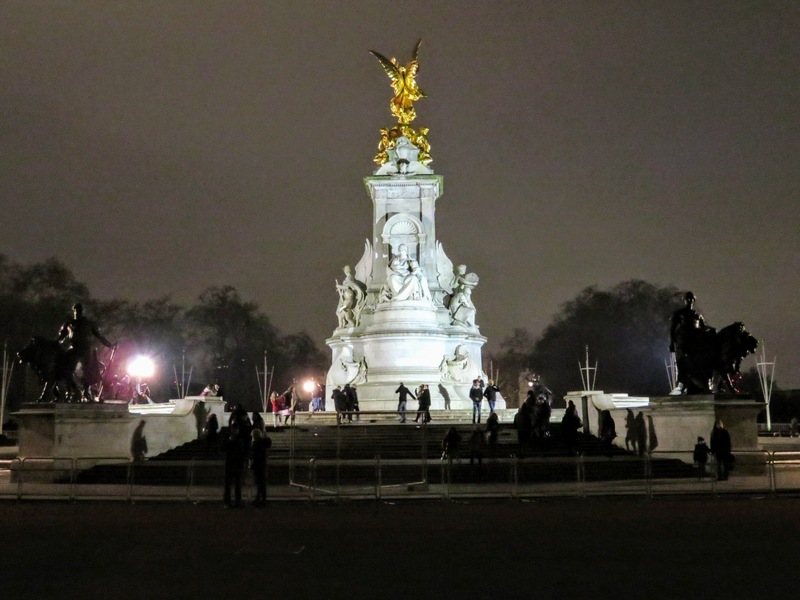 We planned this walking tour with the help of British friends, colleagues, and the internet, and believe it is an awesome way to see some of the highlights of the city. We began at Victoria Station, which is the terminus of the Gatwick Express, straight out of the airport. 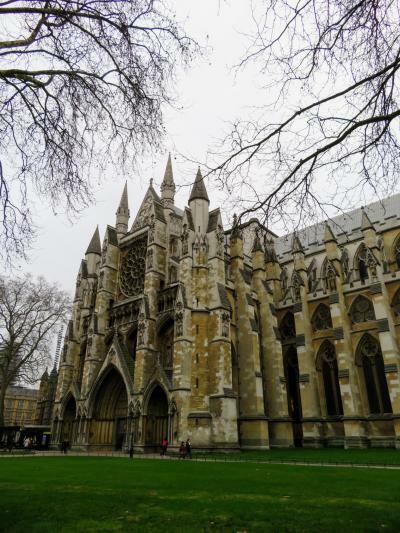 Our flight was unfortunately delayed by several hours on our way to London so we started the itinerary on one day, jumped on the tube and went to our Airbnb to sleep, and started the next day at the same tube stop to continue our tour. 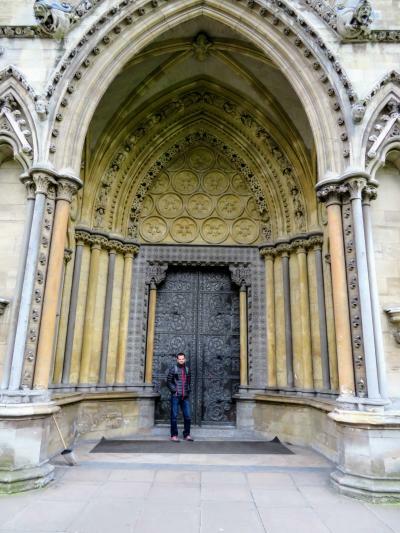 We also didn’t go inside several of the historic buildings because we had limited time. The beauty of planning an itinerary like this is that it is entirely self-paced (and free). 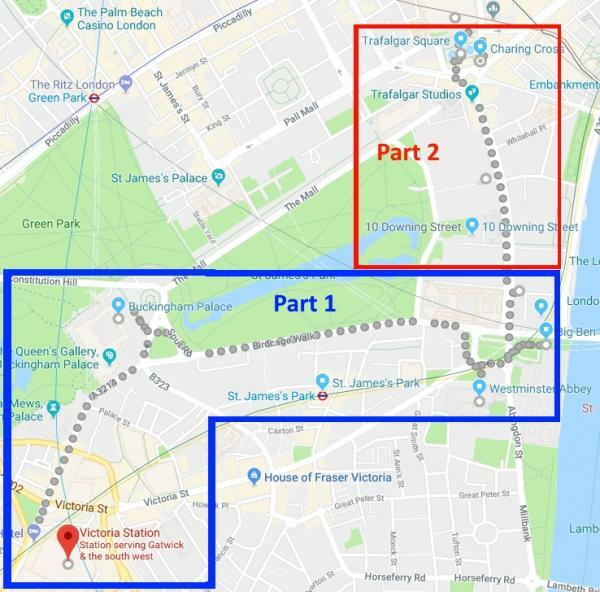 If you wanted to use this route, you could break it up into as many segments as you like and take as long as you want for each stop. Parts 1 and 2 of our walking tour of London. Part 3 will require a tube ride and separate map. For a live map of this leg of the trip, click here. 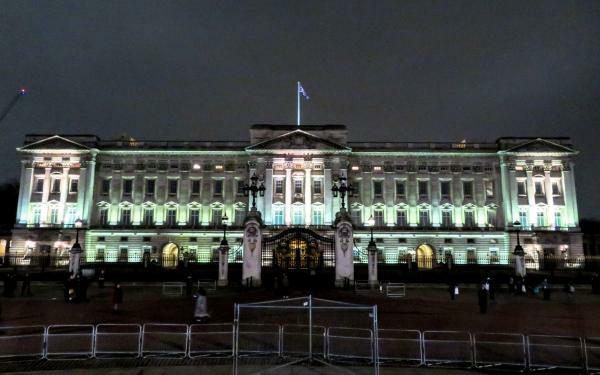 Buckingham Palace is the Queen’s weekday home, which she refers to as her office. Her back yard consists of heavily guarded gardens with barbed wire and electric fences reminiscent of Jurassic park. 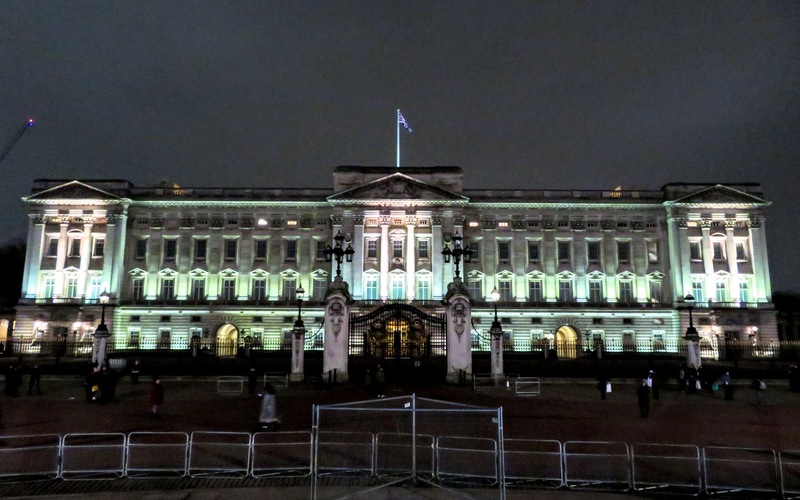 Her front yard is basically London. 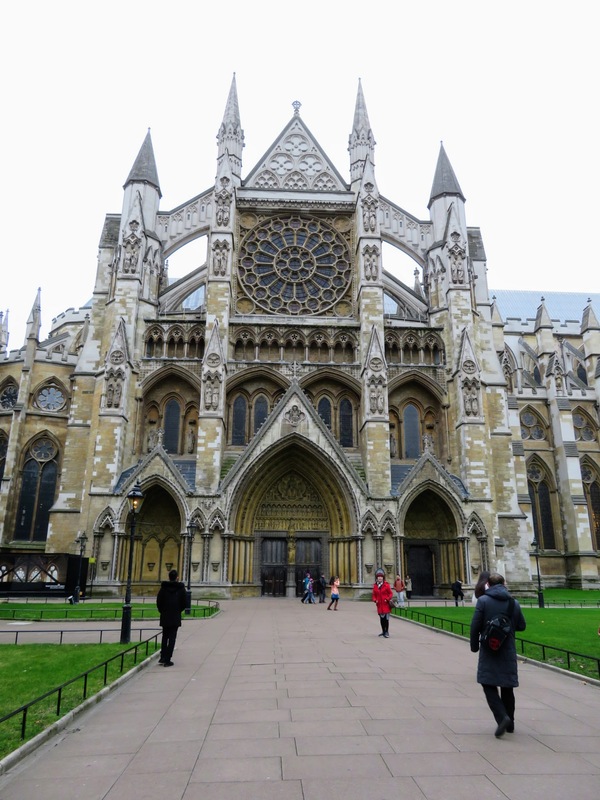 The history of Westminster Abbey dates back to 960 AD and the construction of the building you see here began in 1245 AD. It is the site of royal coronations, weddings, burials and memorials. The attention to detail on every surface of this building was overwhelming. Josh was especially taken with the wood and metal, highly ornate door. This was my favorite shot of the church. 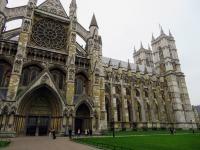 The Abbey charges for admission and sees over 1,000,000 visitors a year, with peak season being the summer. Note the lack of crowds in January. Parliament Square is gorgeous. 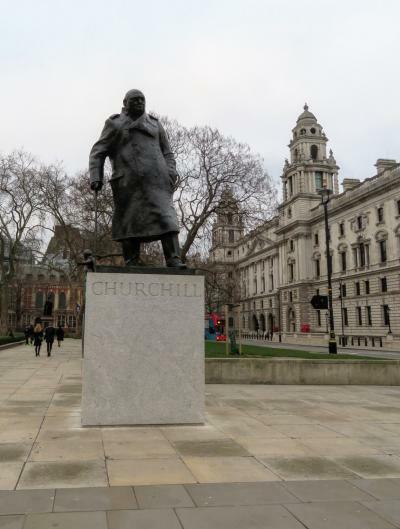 In addition to typical government buildings, it is full of giant statues of important historical British figures including Winston Churchill, Mahatma Gandhi, Nelson Mandela, and Abraham Lincoln. Wait… what? Well, they’re all there anyway. It would also be the best view of Big Ben, were it not under scaffolding for restoration at the time we visited. The presence of both Mahatma Gandhi and Winston Churchill on the same square was striking, considering that their views on Indian independence vehemently opposed one another. 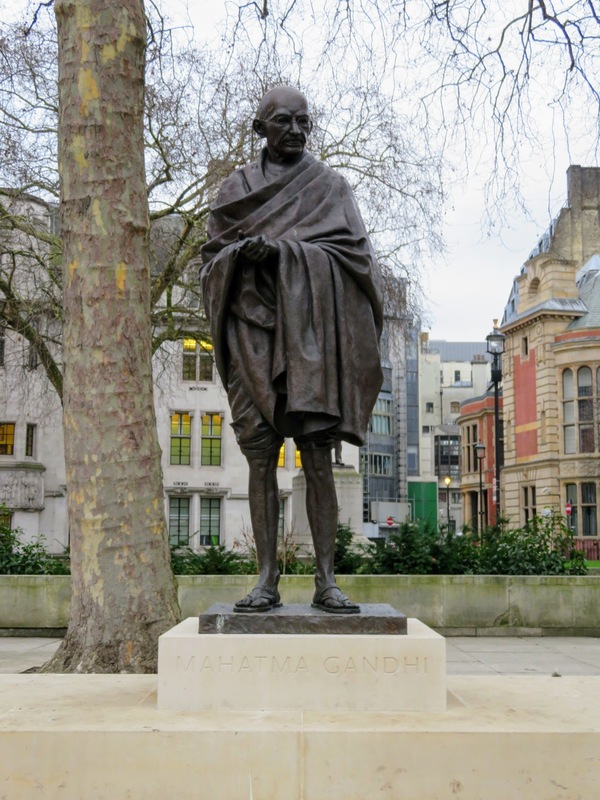 According to Wikipedia, Churchill famously once called Gandhi “a seditious Middle Temple lawyer, now posing as a fakir of a type well known in the East, striding half-naked up the steps of the Vice-regal palace”. He stands here next to Nelson Mandela, (not pictured). 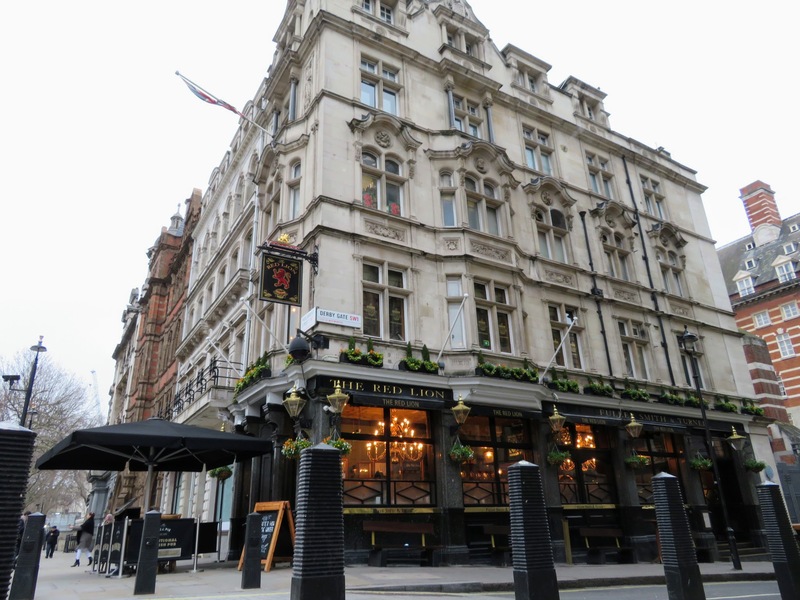 If you’re feeling famished or fancy a pint, consider stopping in at the Red Lion or Fuller’s Pie and Ale House, right off Parliament Square. 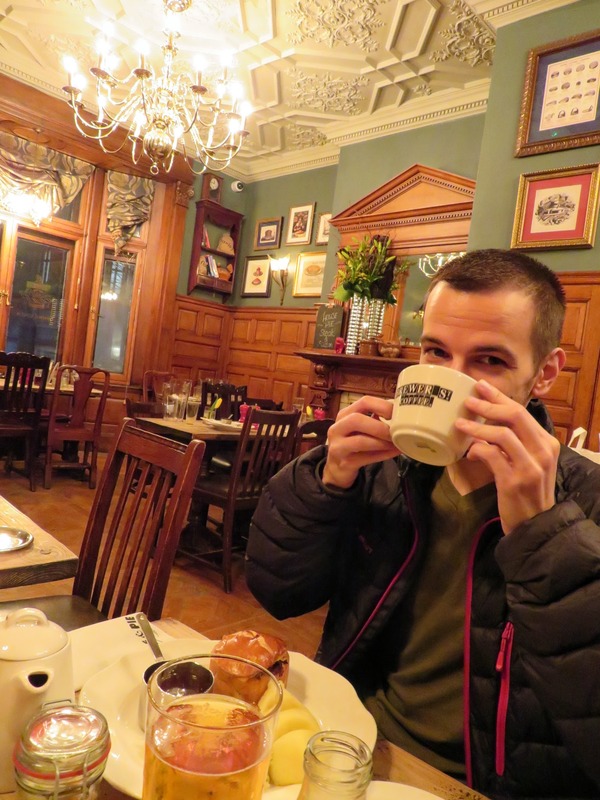 It was the most expensive food we ate in the UK but quintessentially British. The pies were slightly better than average meat-and-pastry-themed foodstuffs and I wasn’t impressed with the beer. The tea, however, was fantastic. It’s time for a tea break, but the tour doesn’t stop here!